I've been playing for about a few months, and I've instantly been taken by the possibilities with electricity. Now, this isn't the usual kind of thing posted on the forum, but I think it has its own kind of beauty. First, I developed a kind of diode that wasn't flawed and prone to break. Second, I started playing around with electricity and heat. Without temperature, a lot of cool stuff wouldn't be possible. I've made more things than this, including many different types of auto-reloading "Cannons" (Even TNT ones! ), a descent slower, and a fast wire, but the screenshot ability is kind of broken, so I can't take pictures of those in action. 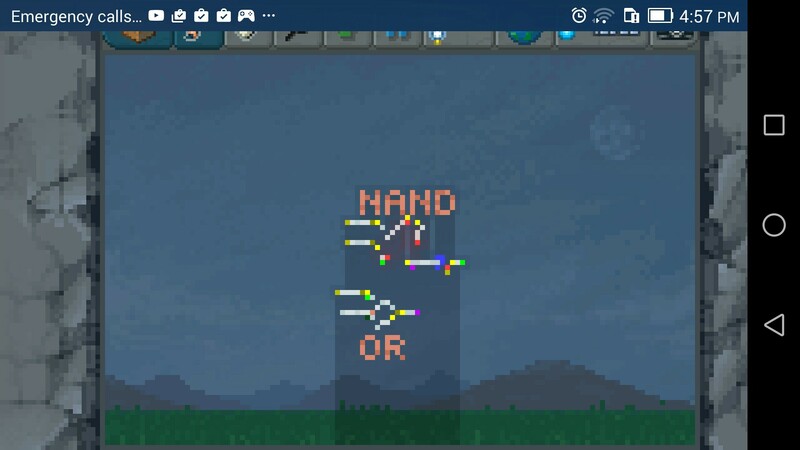 Without further ado, here's a picture of the logic gates. Sorry about the stuff on the top and right, had to use my phone's built-in screenshot ability. I'd be happy to explain anything, if there are questions.